Discussion in 'Edged Tools' started by JD Miller, Nov 10, 2018.
americanstrat98, Sosteve, kronin323 and 9 others like this. Sosteve, Dadio, LostViking and 4 others like this. To be honest, it does look to be ground that way, rather than broken. What a strange piece. Otterdad, Sosteve, central joe and 1 other person like this. It must be worth alot! Better tap into my retirement and buy it! Sosteve, LostViking and central joe like this. Sosteve, cbrianroll and central joe like this. Sosteve, cbrianroll and Skeptiksks like this. Sosteve and cbrianroll like this. I thought someone was messing with us lol...not sure why a firefighter would need the odd shape....an aviation sheet metal cutter makes more sense..
Sosteve, Skeptiksks and Lichen like this. Something the Vikings would use, to chop their way out of a crashed helicopter? Dunno. americanstrat98, Sosteve, LostViking and 3 others like this. That is the famed Viking Scallop Axe. Used by Eric the Seafood Eater. He was known by all Northmen for his Shelfish dinner parties. Very rare indeed. Sosteve, jasam and Skeptiksks like this. americanstrat98, Paulyseggs, Sosteve and 6 others like this. Sosteve and Skeptiksks like this. highlander, kronin323, LongChinJon and 3 others like this. They called it the pilot crash crew axe. So it's probably patterned after some sort of 1960s era aircraft rescue tool. lowtidejoe, LongChinJon, Sosteve and 8 others like this. Looks like a real life GI Joe "Red Ax" from the 1960s. Sosteve, cbrianroll, Skeptiksks and 1 other person like this. Ha! That was my first thought when I saw the picture in the OP! I had that when I was a kid. americanstrat98, Sosteve, cbrianroll and 3 others like this. Yeah you could see how the design in the OP would lend itself to a sort of "punch and saw" technique to pierce the hull and cut open the aircraft body. Pretty specialized tool. Sosteve, cbrianroll and Vanitas like this. Draeger made the fiberglass handled ones I saw in the cockpits of some cargo aircraft I was on in the 80s and 90s. As someone attempting to get a private pilot's rating. I am told they were expensive as hell to replace. In those days they kept in a kit behind the navigator's seat-at least on some of the big birds. They were intended to allow aircrew to cut away bulkheads in the event of a hard-to-reach in flight fire-usually electrical. Not an every day thing, but not as uncommon as you would think, either. I am told post 9-11 the FAA got hinky about a "weapon" on board airliners, so it was replaced with an insulated crowbar. No doubt some appointed bureaucrat was proud of that insight. We all know crowbars could never be used as a weapon, don't we kiddies? EDIT: It is spelled "Drager", umlaut over the a, they're out of the Netherlands, and they're still in business. Medicine maker, Vanitas, Paul Foreman and 5 others like this. Skeptiksks, americanstrat98, A K Church and 1 other person like this. Large axe for rescue operations, especially for helideck platform. 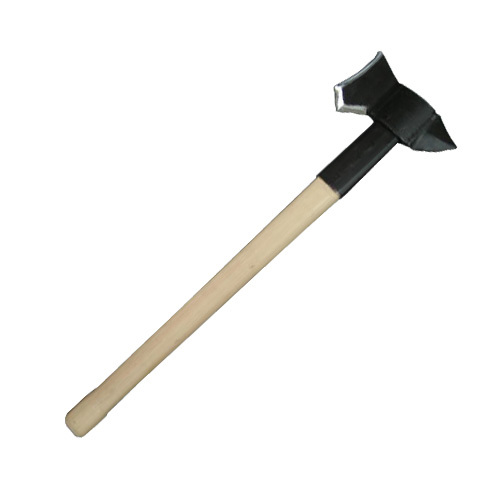 This axe is recommended by Civil Aviation Authority. Medicine maker, Skeptiksks and A K Church like this. Now that I studied it. It looks like it could be used like a giant can opener. Skeptiksks, americanstrat98 and PVF1 like this. PVF1, Skeptiksks and americanstrat98 like this. Thats very cool, it looks as though someone used it with all that wear below the head. Thanks for sharing everyone. Learn something new every day. PVF1 and Skeptiksks like this.